John Lloyd Hayes, b . April 15, 1951 in Owensboro, KY. John, our beloved husband, brother, uncle and friend, passed away on August 17, 2018 after a brave battle with cancer. He is survived by his husband and partner of 44 years, Jim Hoffman. Also surviving are sisters Barbara (Jim) Pendleton of Rockport, IN and Ruth LaMaitre (Tony Hamilton) and brothers Bill and Joe (Peggy) Hayes all of Owensboro, KY. As well, numerous nieces and nephews and their children and grandchildren remain who were always precious to him. John was preceded in death by his sister, Darlene Hayes of Owensboro, KY.
John graduated from St. Francis Seminary High School in Cincinnati, OH in 1969 and Southern Illinois University in Carbondale in 1976. During his years in accounts payable he worked for Blockbuster, Extended Stay America and National Beverage Corporation. John was a sports fan. He followed the Cowboys even before he lived in the Dallas suburbs for three years - 1997 to 2000. Also a fan of the SF Giants, John lived in San Francisco from 1978 to 1983. He attended home games for SF and the Oakland A’s as well as college basketball at Berkeley and one Super Bowl during those years. John was active, playing tennis in the 70’s and 80’s, doing aerobics at the Backstreet Club downtown in the 80’s and step aerobics at home until he wore out the Rebok VHS. He worked in a home gym through the end of the ‘80s and all the 90’s. Then, he started walking and walked hundreds of miles at Giusti Park and Royal Palm Park in Oakland Park. He would drive to the parks at sunrise and walk 4-5 miles several times a week. John read huge amounts of fantasy novels and loved the long series that would be 10,000+ pages. His favorite band was the Kinks. He saw them live several times. 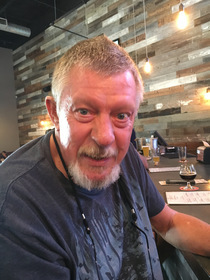 John was a beer tourist and enjoyed visiting breweries whenever he traveled as well as at home. He was on the first Funky Buddha Beer Cruise. John was happy to know that his farewell party would be in a place that he loved and among the people he loved: at the Funky Buddha. Cremation services provided by Brooks Cremation and Funeral Service, Ft. Lauderdale. A very casual and kid-friendly Celebration of Life for John will be held at the Funky Buddha Brewery on Saturday, September 8th from 12 noon to 3 p.m. For any questions about the event, contact Jim. In lieu of flowers, donations may be made to The Poverello Center, Inc.